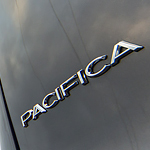 Here at St. Paul Chrysler Dodge Jeep Ram we are super excited to share all of the amazing exterior features of the 2019 Chrysler Pacifica. This popular family-friendly minivan has taken the idea of a family vehicle to a whole new level. Anyone who has kids knows that loading and unloading the vehicle can be a real struggle. With car seats, groceries, pets, and more, it can seem as if you need another set of hands. Luckily, the Chrysler Pacifica offers hands-free power sliding doors. Just kick your foot under the sensor, and the door automatically opens. Many images may come to mind when you think about minivans. This Chrysler minivan will crush all of the minivan stereotypes. In addition to a wide selection of gorgeous color options, this minivan has a tri-pane panoramic sunroof, aluminum wheels with your choice of finish, and LED signature daytime running lamps. We know that you'll want to see all of this for yourself. Come down to St. Paul Chrysler Dodge Jeep Ram, and we'll set you up for a test drive.